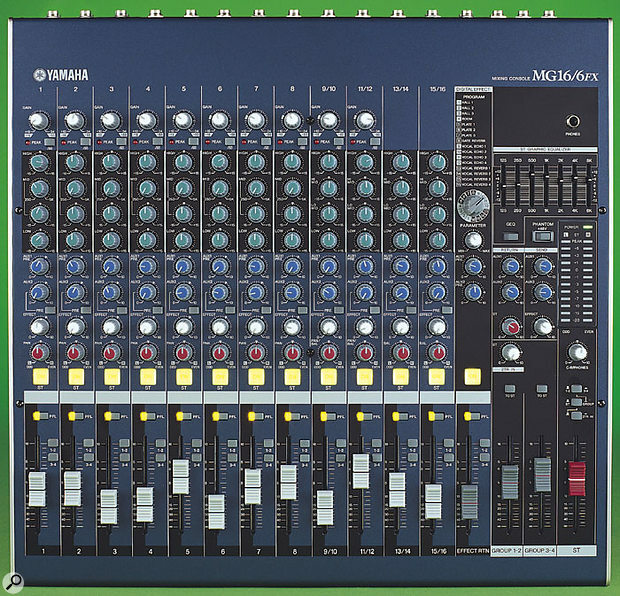 Another affordable mixer from Yamaha offers 16-channel, four-bus architecture, with a surprisingly good built-in effects section. A short while ago, we reviewed Yamaha's budget MG16/4 mixer, which is part of a range built in China to achieve a competitive UK selling price. The MG16/6FX is also part of this series and boasts 16 inputs, four group buses and an in-built effects processor fed from a dedicated channel send control. There's also a seven-band graphic equaliser, which is particularly useful in compensating for room characteristics in live situations. The wedge-shaped case is made from steel, with most of the connectors on the rear panel. Alloy end cheeks complement the blue and black paintwork, against which the white legending makes a clear contrast. The end cheeks can be replaced with rackmounting strips, and power comes from the included external adaptor with locking connector. Channels one to eight are mono mic/line channels, while channels 9-16 are arranged in stereo pairs and operate only at line level. Of these, only channels 9/10 and 11/12 have input gain trims and high-pass filters, but all channels have EQ and the same aux send facilities. Channels one to eight have balanced XLR mic inputs with globally switchable 48V phantom power, where the balanced line inputs are on quarter-inch jacks. Insert points are provided on TRS jacks for all the mic/line channels, but not for the main output or buses. The inserts are the uppermost sockets on the rear panel, which makes them easy to access for users who don't work via a patchbay. There are no direct channel outs, which would have been useful in some recording situations, but the bus architecture still makes it possible to record multiple sources at the same time. Channels 9-16 each have two balanced jack inputs (left and right) with additional -10dBV unbalanced phonos feeding the last four channels as well. The main output is presented on both balanced XLRs and jacks, with four further impedance-balanced jacks handling the four bus outs. Phonos are fitted for two-track inputs and outputs, and there are balanced jacks for the control room output. The console is fitted with three send controls per channel, one feeding the internal effects processor plus an Effect Out jack, and the others feeding two Aux Out sockets. The desk has only a single stereo aux return, which may be used in mono by plugging into the left jack. The mono mic/line channels have a gain control providing up to 60dB of mic gain or 34dB of line gain, with a further 10dB of gain being available via the channel faders. An 80Hz switchable low-cut filter is fitted to channels 1-12 for filtering out very low frequencies such as traffic noise or stage rumble, though the final two stereo channels have no input trim or filter, so the input level needs to be set at source. Most small mixers have a three-band EQ section, often with a swept mid-band. However, Yamaha have opted for a combined approach, with a four-band, fixed-frequency EQ on the stereo channels and a three-band, swept mid-band EQ on the mono channels. High and low shelving is at 10kHz and 100Hz in all cases. The mid-bands on the stereo channels are fixed at 800Hz and 3kHz, while the mono channels' mid-bands can be swept from 250Hz to 5kHz. All have a ±15dB gain range with detented centre positions, but no bypass switch. There are two aux send controls and one Effect control per channel, the first send being fixed pre-fader. Aux two is switchable pre- or post-fader, while Effect feeds the internal effects processor. All the mono channels have conventional pan controls, while the line channels have a stereo balance control and the aux sends fed from the stereo channels comprise a mono sum of the left and right inputs. A square, backlit On ST button functions as a stereo bus mute/on switch for the individual channels or the internal effects return signal (though it doesn't affect the bus assignments) while an illuminated PFL button allows the pre-fader channel signal to be sent to the solo bus for signal checking or gain setting. PFL affects the control room and phones outputs, but not the main outputs, and for gain-setting purposes the PFL level is indicated on the main level meters. All channels (including the internal effects return) are equipped with a pair of routing buttons to send the channel signal to bus outputs 1/2 or 3/4 independent of the On ST switch status. All the faders are 60mm types. The master section includes the global phantom power switch, with status lamp, plus a rotary level control for the two-track inputs. Two 12-section LED meters monitor the main output or PFL level, and a single rotary control governs both the control-room and phones output levels. Three switches enable monitoring of the main stereo output, either of the group outs or the two-track return. 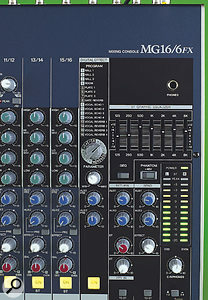 Three stereo faders control the group and mix bus outputs, and are positioned to the right of the stereo fader governing the return level from the internal effects processor. Either group may also be routed into the main stereo mix via a To ST button above the respective group fader. Master level controls are fitted for the two aux sends, and next to these controls is the aux return section, which includes a stereo level control for feeding signal into the main stereo mix, plus two further send controls for feeding either or both of the aux sends. While careless use of these controls could set up a feedback path, it does allow the returns to be used as additional line inputs with aux sends. That leaves the graphic equaliser, which affects only the stereo outs. This is activated via the GEQ switch and provides ±12dB at 125Hz, 250Hz, 500Hz, 1kHz, 2kHz, 4kHz and 8kHz. This is adequate for taming the worst excesses of a live room, but a third-octave equaliser is needed to deal with feedback effectively, as the bands on a seven-band equaliser each affect a whole octave of the frequency spectrum. Photo: Mark EwingThe specifications don't reveal whether the effects are based on any existing Yamaha algorithms, or were designed especially for this mixer, but they sounded much better than I was expecting. A simple rotary switch selects from 16 preset reverb or echo programs, after which, a single Parameter control adjusts the key parameter for the selected effect. The level of effect per channel is set using the channel Effect knob, while the overall effect return level is set using the fader on the dedicated effect return channel. As with the external aux return, two aux send controls are fitted, allowing the internal effects also to be sent to either of the pre-fade aux send buses. The effects are broken down into Hall, Room, Plate, Gate Reverb, Vocal Echo and Vocal Reverb (which actually combines reverb and delay). The reverb quality is as good as I've heard from any integrated effects section, and rather better than from some stand-alone units I've used. While the editing is limited, you can at least control the decay time of the reverbs and the delay time of the echo effects using the Parameter knob. As far as I can see, the spec for this mixer is virtually identical to that of the MG16/4 I've already reviewed, with a mic input noise figure of -128dBu EIN and a frequency response flat within +1dB/-3dB from 20Hz to 20kHz. The maximum stereo output level is +24dB and the distortion (maximum gain control settings) is 0.1 percent. Despite not having a rarefied frequency response, the top end sounds sweet and clean when DI'ing or using decent capacitor mics, and the EQ does as well as or better than you can reasonably expect from a budget mixer. The high and low shelving EQs are particularly musical, but I find the mid-bands are best used sparingly, and where possible in cut rather than boost mode. In normal use the mixer is pretty quiet, though excessive use of channel EQ or graphic EQ at the high end inevitably brings up the background noise somewhat, as does using a very high level of internal effect return. In this respect, the performance is similar to other well-designed small mixers, but it pays to be aware of it and underlines the importance of paying attention to gain structure. I also noticed a moderate thump over the monitors when switching the phantom power on, so this is perhaps best done with the monitor level turned down. Despite the inevitable limitations of small-console EQ, the overall sound quality is actually very good, with negligible distortion and crosstalk, and adequate headroom. I was particularly impressed by the quality of the reverb effects, and even the graphic EQ sounded more musical than I'm used to hearing from budget equalisers. You certainly shouldn't get the feeling that you're having to work with second-class effects, as what's on offer here will blow the socks off most plug-ins! Yamaha have managed to include some serious features in a very attractively priced mixer which is well suited both to small-scale live sound and recording. Its four-bus structure makes up in part for the lack of direct outs, and with a little lateral thinking you could record up to eight tracks at a time by using all the buses, the stereo out and the pre-fade aux sends as sources while monitoring the stereo output from a soundcard via the two-track input and setting the control room monitoring source to two-track. 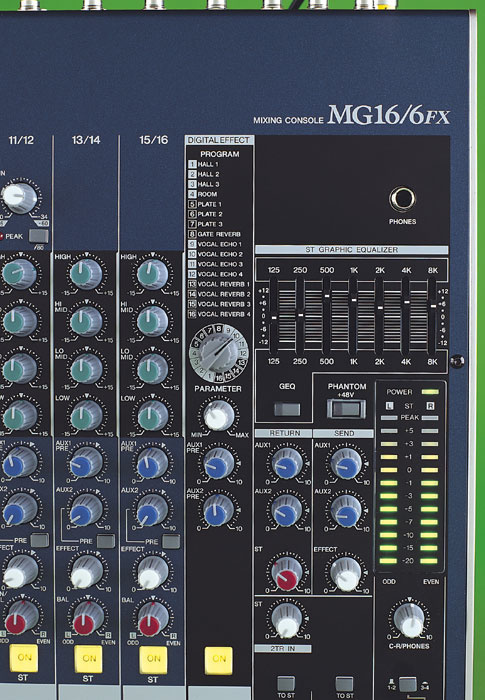 To sum up, the MG16/6FX is a fine all-rounder for anyone needing a good-sounding small mixer with in-built effects and more comprehensive routing than normal on a mixer of this size. Simple but great-sounding effect section. An affordable and compact mixer with good effects that has obvious live sound applications, but also enough routing options to satisfy the needs of the small studio, especially one based around a soundcard.